A lot of accidents can occur out on the Manatee River, but fortunately most are more annoying and embarrassing than anything else. When lives are in danger, however, you want every available resource dispatched to your vessel. A Mayday! call will alert that kind of help. A Mayday should be transmitted, if possible, via marine-band VHF-FM radio Channel 16 or 2182 kHz MF/SSB. Emergencies rapidly progress from bad to worse, so try to relay a lot of information quickly. You should repeat the word “Mayday” three times, followed by the name and number of your vessel and its position in the water. Then, relate the latitudinal and longitudinal coordinates of your position, or state your distance and magnetic or true bearing from the closest navigational landmark. Once you’ve made contact and given your information, Coast Guard Search and Rescue planners will give you an estimate of when rescue units will arrive. If you have a medical emergency, make sure someone is monitoring the radio. The Coast Guard will guide you to the nearest safe haven and advise you on what actions to take in the meantime. When the Coast Guard receives your Mayday, the Mission Coordinator will determine your degree of danger by considering several factors: the nature of your situation, the emergency gear on board your vessel, your position, the tide, visibility, current and sea conditions, weather, age/health of those on board, whether you have reliable communications, and the potential for the situation to worsen. If a helicopter is dispatched, be sure to secure all loose items on deck. Remember, never shine a light directly toward the helicopter, and never fire flares toward the helicopter. Wait for the rescuers to tell you what to do, and then do it. Listening is key. Recently, the Coast Guard began implementing a new command, control and communications system (Rescue 21), which is now being installed in stages across the United States. It will significantly improve the Coast Guard’s ability to save lives. Employing advanced communications technology, this system will cover coastlines, navigable rivers and waterways in the continental United States, Alaska, Hawaii, Guam and Puerto Rico. It will also help eliminate 88 known radio coverage gaps. You don’t need any new equipment to benefit from Rescue 21, but you can help improve response time by upgrading to a Marine-Band VHF-FM radio equipped with digital selective calling (DSC). When properly registered with a Maritime Mobile Service Identity (MMSI) number and interfaced with GPS, the DSC radio signal transmits important vessel information with one push of a button. The U.S. Coast Guard is always prepared to assist boaters facing extreme and imminent danger. Your best bet, however, is to decrease your risk of encountering an emergency in the first place. Keep your vessel’s equipment in top condition. At the start of the boating season, get a Vessel Safety Check. Take a basic seamanship course and additional instruction as necessary to ensure that your boating skills match the requirements of your vessel. Finally, make sure that everyone on board wears a life jacket at all times when on the Manatee River. If you haven’t heard of Shark Tank, it’s a reality show where aspiring entrepreneurs make business presentations to investors on a panel that includes Mark Cuban, Daymond John, Kevin O’Leary, Barbara Corcoran, Robert Herjavec, and Lori Greiner. Here are some of the “shark tank” products that would be perfect for a day out on the Manatee River. The ZUP™ Watersports Board is a board that can be pulled by any boat or watercraft. It let’s you stand, kneel, lay, surf, etc! Even though this board hasn’t made its debut on Shark Tank, the show has called and asked for a submission video. Mark Cuban got together with this company and it has been successful so far. The Tower Inflatable Stand Up Paddleboard is an inflatable paddleboard that can be easily rolled up into a small, convenient bag. Take these inflatable paddleboards anywhere you want with no hassle at all! In just a few minutes, the Oru Kayak quickly transforms from a box into a boat. Oru Kayak and Robert Herjavec made a deal and now Oru Kayaks are being sold all over the world! Liddup is a cooler that has built in LED lighting. This LED lighting produces no heat and has just the right amount of light to be able to enjoy your favorite beverages! Although you may not need everything that Shark Tank has to offer, we must say some of these products are pretty nifty to use. Perhaps the next time we see you at our Palmetto Marina you may be able to show us the newest Shark Tank product you are using for your boat. 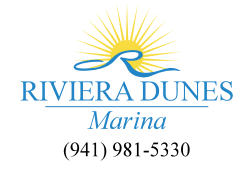 Be sure to check out our other recent blogs as well in our Riviera Dunes Marina blog section to keep up to date with your favorite Palmetto Marina! No matter what level of a boater you may be, you can always use some additional tips and tricks when out in the ocean. Here are some of our all time favorite Palmetto boating tips and tricks. Wipe morning dew off your boat with distilled water and it will be ­spot-free. For a snazzy shine, remove last season’s wax with a dewaxing solvent before applying new wax. Want a green alternative to bleach? White vinegar kills mold. Need to clean a shore-power cord? Citrus pumice-style hand cleaners work well. For safety, always move an orbital polisher in the direction of its rotation. Oven-cleaner spray will remove paint and adhesive residue from gelcoat without damaging it. Make a splash guard from cardboard when using a drill-operated paint mixer. Scraping paint or caulking? Use a file to soften the ­corners of a putty knife “scraper” so it won’t gouge. Punching holes at “N-S-E-W” around a paint can’s rim allows paint to drain back into the can. A squirt of spray lube can return an electric horn to normal. Is glare at the helm reducing your visibility? Place a dark towel or shirt under the windshield. For a crisp waterline, “burnish” masking tape by rubbing its edges down with a paintbrush handle. A 50/50 mix of acetone and automatic transmission fluid is a great solvent to free corroded fasteners. A safety pin makes a good tool for removing a bad hydraulic steering seal. Carry a spare belt – Just in case. Also carry a spare primer bulb. A section of rigid hose, cut to length, can protect outboard props from damage during storage. Free play in hydraulic steering can often be eliminated by simply adding fluid to the helm pump. Check all fasteners, supports and plumbing to prevent carbon monoxide poisoning. T-clamps are more expensive but clamp hoses evenly; worm-gear hose clamps can distort. A wet towel can be placed under a cooler to keep it from sliding around. Liquid dish soap applied to carpeted trailer bunks will help the boat slide off more easily at a shallow ramp. Wipe your boat down with liquid soap before a long tow to make bugs and grit easy to remove once you arrive. Rigging tip: Coating cables with baby powder makes them easier to pull through the boat. Monitor your boat through a few tide cycles after first launching to make sure you’ve ­correctly adjusted the dock lines. “Mouse” anchor shackle pins with stainless steel or Monel seizing wire. You can break the seal of ­polyurethane adhesives like 3M 5200 by heating the fastener with a soldering iron. It’s stainless steel, not stain-free steel. Crevice corrosion attacks stainless where you can’t see it. Strange leaks are often the result of failed deck plate and hatch O-rings. Check the chain, thread and O-ring on fuel fill caps to help protect the fuel tank from water intrusion. Locking pliers, clamped to a protruding fastener and with their jaws abutting the nut, allow you to gently pry the stud until it breaks off clean. Masking tape will help prevent chipping when drilling holes in fiberglass. Caulk dipped in ­petroleum jelly provides a better seal than a nail. Make rigging wires, hoses and cables easier by dipping a rag in silicone spray and running the cables through the rag before pulling them through the boat. Top off ­batteries with distilled water, available at a drugstore. Do you have any other Palmetto Boating tips you may want to add? Visit our Facebook Page and post them to our wall for us to spotlight you! The yearly Crosthwait Memorial Fishing Tournament, now in its 36th year, is a fantastic tournament. The fishing community comes together each May for this local tradition. Kennedy has helped the tournament evolve over his almost three decades of involvement. What started as a small gathering among friends has grown into the event anglers talk about year-round. Behind-the-scenes tournament planning also starts early in the year for the committee volunteers. In addition to tournament logistics, the committee helps keep the Crosthwait competitive in regard to points. As always, the tournament will be taking place at the Bradenton Yacht Club starting at noon Sunday for junior division teams. This year features 13 boats in the junior division, 63 boats in the inshore division and nine boats in the offshore division. Never forget to check the weather before you leave whether it’s through the radio, internet or television. Maintain your safety by getting out of the water if you notice rough changing winds, drops in temperature or dark clouds start to form. Don’t forget to follow a pre-departure checklist to make sure you don’t overlook or forget any Palmetto boating safety rules. Always use your common sense! This means staying alert, operating at safe speeds all the time and being respectful of buoys that are there to ensure your safety. Make sure that there is a designated person that can serve as back up if the primary navigator gets injured or incapacitated. Make sure this person is familiar with operating the boat and all boating safety rules. A float plan can be important and will let someone know how long you’re going to be gone and where you’re going. Some of the information float plans include are name and phone numbers of all passengers, boat registration information, trip itinerary and the type of signal equipment onboard. Make sure that all passengers are always assigned a lifejacket and that it fits each and every person. Remember to save alcohol for later. The chances of being involved in a boating accident doubles when alcohol is involved. Always remember that proper Palmetto boating safety includes knowing how to swim. If you’re not sure if you’re comfortable in or around the water be sure to check out what classes are offered in your area. Education on Palmetto boating varies by state and some states require completion of at least one boating safety course. Even if your state doesn’t require this, it’s important to be educated on boating. There are free vessel safety checks that are offered by the US Coast Guard that you can take advantage of. These safety checks are free boat examinations to make sure that the boat is in the right condition and that state and federal regulations are being followed. Teach Children About Boats and Watch The Enthusiasm Grow! Racing isn’t everything, there are other ways to acquire boating skills. Teach children how much fun boating can be and watch the numbers grow. Brittany, a young girl who recently dreamed off going boating finally went off to boating school. She said that she really loved how much fun it was when she was being taught about the wind and how the boat worked. When they started racing, it became stressful for her and she really hated it. After that, she never went back to boating school. Afterwards, these findings were shared with a boating program coordinator and they started something new. They started a program where they hired a boating naturalist that would take the kids along the shore in the sailboats and observe ocean life. It was a huge success! boating is supposed to be about enjoying the beauty of the water and challenging yourself. Let’s change the way boating is taught to allow children to learn the way they want to and having fun while doing it. Teaching children about the boating life can spark a true interest in enjoying the open ocean and rivers around our Palmetto marina. In a time when racing is what ever child wants to do, it is great to just teach our future generations about how the boating life can truly be a hobby and lifestyle that they may want to indulge in as well. of course, always feel free to show them around our docks to peak their interest even more on how the boats work, what it is like to be the captain of a vessel and of course what they can look forward to later on in life. Hats off to Gunboat. 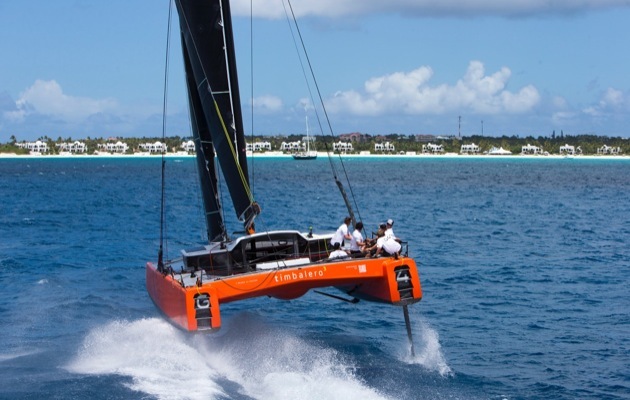 The company has produced the world’s first foiling ‘cruising’ yacht. 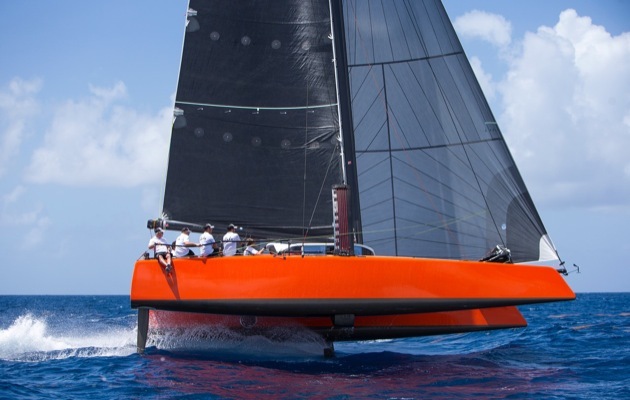 The G4 launched this week in St Maarten, rose onto her foils in 14 knots wind, and has already hit 30 knots. 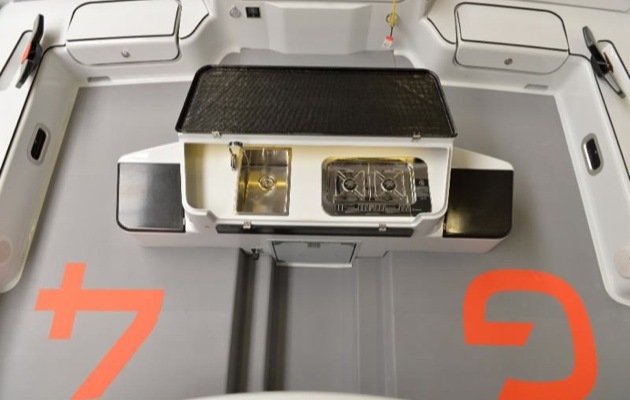 In one of the most profound steps in boatbuilding history, Johnstone, the Dutch DNA design team and builders Holland Composites have created the first production cruising foiler. Initial trials have been held in various winds this week from 9-25 knots. The G4 has another jaw dropping wow-factor: she also offers accommodation. The cockpit has a galley style island for cooking and socializing as well as two double and two single berths within. Gunboat took a big risk with this ingenious project. After the results of these early trials, they will definitely receive a string of orders for this awesome new ride. Would you ever want to see this type of yacht in our Palmetto marina? Big or small, every Palmetto boat needs to be maintained. Fortunately, routine boat maintenance isn’t that difficult. In the long run, a little work will definitely pay off. Here are our top tips for your Springtime Palmetto Boat Maintenance. The first and easiest task is to wash your boat on a regular basis. If you boat in saltwater, rinse your boat with fresh water after every outing to get rid of salt residue. If left on too long, salt will corrode your boat. Marine boat wash, car wash soap, and laundry soap all work to clean your boat thoroughly. Just like cars, boats need to have their oil changed regularly. The frequency will vary by model but a good rule of thumb is to change the oil every 100 hours of operation or once a year. Unfortunately, there aren’t any quick change oil shops for boats, so you either have to do it yourself or take it to your local dealer. Luckily, changing the oil in your boat’s engine is easy and can be completely quickly. Step 1 – If your boat is in the water, start the engine to warm it up. If your boat is on a trailer, you’ll need to supply cooling water to the water intake at the gearcase. Step 2 – After 5 minutes, turn it off and remove the dipstick. Step 3 – Insert the oil extractor suction tube into the dipstick tube and slide it all the way in until it stops. Pump out the oil. Step 4 – Hold a rag around the oil filter and remove it with the wrench. Screw on the new one after rubbing oil on the sealing gasket. Some engines have a special drain tube fit to the oil pan. You pull this tube out the bilge drain and drain the engine without ever dropping a drip on the bilge. Some outboards have comparably simple drainage mechanisms as well. Check your owner manual for the exact procedure. If you have an outboard or stern drive boat you should check the propeller as part of your pre-launch routine. Use a deep well socket to remove the propeller a few times times during the season to make sure discarded fishing line hasn’t become wrapped around the propeller shaft. While you have the propeller off, inspect it for nicks, dents and other signs of damage. Send it out for repairs if you find any damage. The smallest dent can cause your boat to lose performance and burn excessive fuel. Finally, put a liberal amount of waterproof grease on the propeller shaft to prevent corrosion from “freezing” it in place. Then re-install the propeller and hardware in the same order that you took them off. All of these tips will help your Palmetto boat to thrive in the warmer months this upcoming Spring and Summer and will keep it up to date and picture perfect for relaxing. People have been naming their Palmetto boat for years. I have been trying for seven months. Early on, boats were named after gods, goddesses or saints to coax protection for the boat. Names were frequently feminine, since boats and the sea are both considered such. Since those days, names have gotten more creative. Some are puns or plays on words (Ship for Brains, Aquaholic) or an inside joke (She Got the House, The Office). In the case of race boats, you may see something competitive (Project Mayhem, Renegade, Nefarious). Some boaters seem not to struggle when picking a Palmetto boat name, and decide on them far before they ever meet the boat in question. Others are so caught up in the bad luck of renaming a boat that they would never change the one currently used. Then, there are those who feel that they need to learn the personality of the boat first. I fall into the third category. Years ago, I would play the “What Would You Name Your Boat” game with friends while out for a day sail. Everyone had great ideas – except me, that is. I believe there should be something majestic about a vessel that is protecting you from high winds, tall seas and dragging anchors. I went through the suggested motions. I searched baby names online. I searched mythological names. I made lists of words I liked. Nothing. The closest I got was Compass Rose. I always loved pictures of antique compass roses, and I loved the thought that these beautiful instruments guided sailors to their destinations. Then I looked up Compass Rose on the Coast Guard documentation website and found almost 100 boats named Compass Rose. I am now considering that she may not tell me her new name until the old name is gone. I realize this is superstition, but what’s left to try? I’m just waiting for the right weather window to take on this project. Until then, and up until now, she remains respectfully “The Challenger.” Somehow I find this more comforting than I would “The Catalina,” “The Beneteau,” or “The Hans.” Perhaps it’s because it has a ring of truth — she is “challenging her (me)” to do things that she hasn’t done before, to do things that she may be a little afraid of, and to learn a great many things she needs to know to be a boat owner. At the end of the day though, it is the captain that makes the boat, but having a clever boat name can make all of the difference. 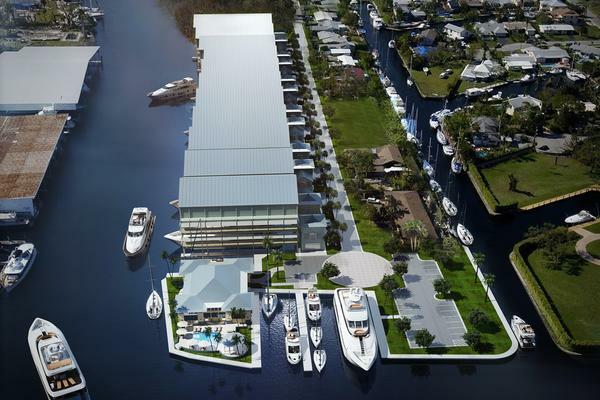 In South Florida, a “dockominium” project – a covered boat slip condo – has been proposed. This is one of the first dockominium projects that have been proposed since the end of the recession. Battle Plan Capital has announced their plans for Harbour Twenty -Six, which will include 26 covered boat slips in a two-story building. The property where the formerly known Pier 17 Marina and Yacht Club was located was acquired for $5.75 million in November 2014. Battle Plan Capital are adapting the Pier 17 plans and adding additional features such as a full club house, work stations, pool, cooking barbeque, entertainment, and a fitness area with 24-hour security. Prices will range from $1.8 million to $3 million depending on the size. Jim Bronstien of U.S. Marinas will be managing the marina while Denison Yacht Sales and Promarine Realty will be in charge of marketing the boat slips. Construction is expected to start in May and the project will be completed summer 2016. It expects to start construction in May and complete the project in summer 2016. What are your thoughts on a project like this? Would you pay extra to have a “dockominium” to come home to, or is your current slip good enough for you to enjoy? 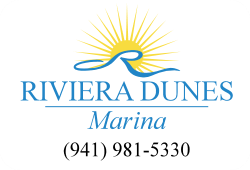 Now if you are looking for the premier Palmetto marina, then coming out to Riviera Dunes Marina may be the best bet for your next trip to the Florida Gulf Coast. Stop by today and say hello to all of our friendly staff members and see just why we are always ranked in the top marina’s in Florida!